Just over a year ago I wrote, “Did Donald Trump Use Artificial Intelligence To Win The Election?”, which was an article about Cambridge Analytica. If you haven’t been paying attention lately, Facebook just banned Cambridge Analytica from their platform, including the whistleblower that blew the whistle on how Cambridge Analytica was potentially misusing data. Meanwhile, the mainstream media has gone into a frenzy, crashing Facebook’s stock, forcing executives out of the company, and calling for social media reform. This story is seriously a year old, and although I was not the first journalist to write about this, I did bring it to the attention of about 6,300+ readers. While it is new that we have a whistleblower, and the number “50 million accounts”, what the media isn’t telling you is how Cambridge Analytica actually pulled this off. The fact of the matter is the data that Cambridge Analytica acquired from Facebook, much of which they obtained legally and as Facebook intended them to, was entirely useless without machine learning. Machine learning is one of the baby steps required for building artificial intelligence, it is a field of computer science that gives computer systems the ability to “learn” with data without being programmed by a person. It was this technology that Cambridge Analytica used to analyze tens of millions of users profiles using data they acquired from Facebook, and put together psychological profiles of users. They then used Facebook’s targeted advertising system to display ads and content at those users geared towards their own psychological profile. Think of it as persuasive arguing on steroids hyper targeted by your own beliefs about the world. For example, I let Cambridge Analytica analyze my data and they pegged me as a liberal. I know this may be a shocking revelation to all of my haters who believe I’m a conservative Russian agent conspiracy theorist who sells tinfoil hats for a living, but according to my Facebook data I’m a liberal. They also determined I’m more intelligent than 96% of Facebook users, and I somehow lost intelligence points because I like the Beatles (mostly a John Lennon fan), but that is a subject for an entirely different article. What this means is Cambridge Analytica knows I am probably not going to vote for Trump based on my psychological profile. However, that is actually more valuable to them than not. There is little point to spending advertising dollars on people who you know will vote for your candidate, the person you want to target is actually the person who will not vote for your candidate and instead convince them to not vote. This is what I believe Cambridge Analytica did, I believe they targeted liberals in swing states and promoted anti-Hillary content in an attempt to convince people not to vote. It means they had to target fewer people, spend less money, and ultimately accomplish their goal of winning the election. All Cambridge Analytica had to do was figure out who was a liberal, and convince them not to show up on election day. By doing so they could ignore everyone who couldn’t vote for whatever reason, and only spend a small portion of their budget on making sure Trump supporters showed up to vote. A no-vote was actually more powerful in swing states, where guess what? Liberal voter turnout was lower for Hillary than it was for Obama. Granted, I still think Hillary blew it and didn’t campaign properly. I am not excusing her ineptitude, she was a horrible candidate and I did not vote for her (Yes, I voted for the female doctor instead, and no I don’t regret it, lets just not talk about it, okay?). Perhaps this is a just a giant coincidence, but I don’t think it is. Given Donald Trump’s ad spend, I’m fairly certain this is exactly what happened. The reason I believe this is because if I were hired to help win an election and had the tools and data Cambridge Analytica had, it is exactly what I would do. I don’t have anything to prove my theory unfortunately, but given what is being reported I am fairly certain I am on to something, and first came up with this theory a year ago before the media went into freak out mode. This is why psychological profiling, privacy, machine learning, and artificial intelligence is so frightening when put in the wrong hands. It isn’t the machines we need to fear, it is the people who are in control of those machines and our data that we need to worry about. Machines are just tools, but people are fickle and with the right incentive easily corrupted. However, Hillary didn’t win despite the fact Facebook was trying to get her elected alongside Google who was censoring search results, possibly running their own bots, and Twitter who was censoring the truth and purposely hiding Wikileaks tweets which are 100% factual (as they later admitted to congress). The reason Hillary Clinton did not win despite the media and social media companies doing everything they could to rig the election in her favor is because Facebook double dipped and allowed Cambridge Analytica to use their surveying tools to collect user data on tens of millions of users. This data was then used to target tens of millions of users with political advertising using Facebook’s ad platform based on psycholgoical profiles from data they bought or acquired from Facebook. Facebook is basically responsible for feeding the analytics system that enabled Cambridge Analytica and the Trump campaign to be so targeted and effective with a minimal budget. They ultimately won Donald Trump the swing states and the election. As well as subverted democracy, and likely made Facebook a bunch of money. That’s what happened, that’s how Trump won. 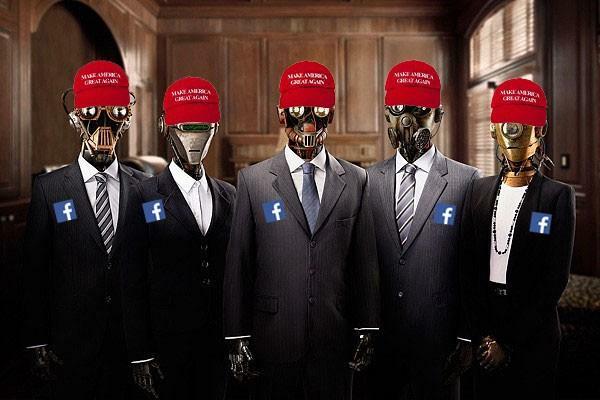 It wasn’t the Russians, it was our own social media companies who sold our data to the Trump campaign which they then likely used to convince liberals not to vote in swing states. It’s both horrifying, and cleverly brilliant at the same time. The funny thing is, Obama did something similar in 2012 and liberals celebrated. Not so funny when the other team takes your trick and executes it more effectively now is it? If you like this article feel free to send some Bitcoin.